SNEAK you way aboard Eradikus Prime! One false step and - Clank! Careless noise draws Eradikus ever closer. To enjoy your plunder, you must reach an escape pod and make your getaway! 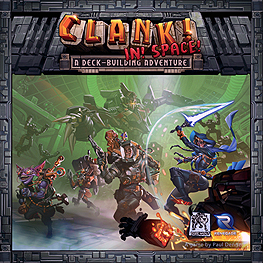 In space, EVERYONE can hear you Clank! We played this with Sally (SG) and Richard (Tree Frog) who kindly invited us to their table at Midcon recently. Me and my two sons were newbs to Clank! but it was very enjoyable. Time flew and each player turn goes quick so several players around the board is not a problem, and actually fuels the 'race' aspect of this game. There is a type of doom-track which is non reversible so the Alien Big Boss inevitably awakes and wreaks more and more damage on the naughty scamps who are stealing valuable assets from his space station. There is also an easy deck-building requirement from players but this is nothing compared with say 'High Command' or even Star Realms. We watched in awe as Richard tooled up his character with the right cards, so that while typically we were drawing three new cards a turn he had loads more to work with. I'm sure I saw him wth fourteen cards in front of him one turn! The deck manipulation means that you can specialise in either speed, healing, attack, buying power etc so there is much replayability in the box. After two more games i'm sure that me, Donald and Alfie would quickly catch on and negotiate our way through the ship much better. This brings me to my only question mark - we were fortunate to play with two veterans of the Clank! game so we avoided having to do any of the complex looking setup or rulebook scouring. But if you get through learning the out of the box setup I can promise you you'll have hours of cool games with lots of variety and nail-biting finishes!